You can’t visit Phra Nakhon without visiting the road that over the years has become the most famous in the neighborhood: Khao San Road. Built in 1892, this road was considered a place to stay by the workers that came to the Thai capital to work in the rice industry. “Khao” in fact means “ground rice” in the local language. From the 80’s up until the beginning of the new millennium, Khao San Road was a very peaceful area with cheap guesthouses and a few stores selling accessories for Buddhist monks. It’s thanks to this latter characteristic that it was given the nickname “religious street”. 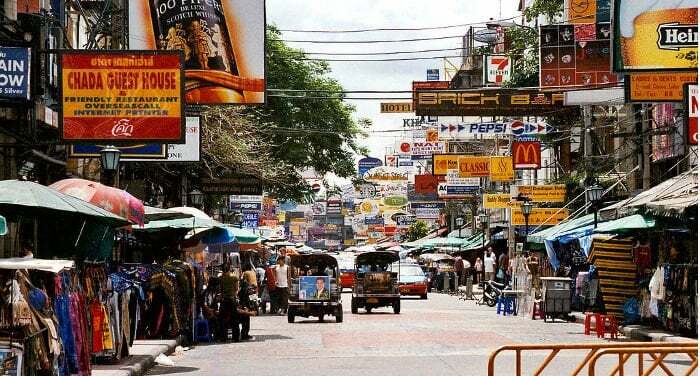 However when Khao San Road was shown in one of the scenes from the movie with Leonardo di Caprio (“The Beach”) in the 2000’s, it became incredibly popular and was transformed into a sought-after destination for backpackers from around the world. Today, besides offering very cheap lodging and restaurants, Khao San Road is also a place where many foreigners (and few locals!) go to enjoy themselves, eat low-cost food, and why not, get a tattoo. The hippie vibe that there was 30 years ago has almost completely disappeared, giving way to confusion and rather sketchy massage centers. thanks to the various clubs and discos, every night there’s a party to go to. The area that includes Khao San Road is not close to the subway nor the BTS. The closest stop is Saphan Taksin, which can be reached (very slowly!) by boat. Besides that, finding a taxi that uses its meter can be very difficult, especially in the evening when the taxi drivers are looking to take advantage. And let’s not even talk about the tuk-tuks! You can get to Khao San Road from the center of Bangkok (Pathum Wan) just by taking a taxi. Depending on the traffic and the exact zone you’re in, the price with the meter on could go for between 60 to 200 THB a ride. Many taxi drivers will try to avoid turning on the meter by saying that Khao San Road is too far, so you have to pay a fixed price. Pay special attention if you’re in areas of Bangkok like Nana or Siam, where these guys are quite active. If you’re spending the evening on Khao San Road and want to get to another part of the city, I recommend that you go to the main road to catch a taxi that will turn on the meter and let you pay an honest price. Just like the tuk-tuks, the taxi drivers wait outside the clubs looking for tourists to fleece. Moving around Bangkok by bus can be a real challenge. Still, it’s definitely an experience worth trying! Besides being a low-cost option, getting around by bus will let you come into contact with the locals and admire the city. The following are direct buses on Khao San Road: 2, 3, 15, 53, 509, and 511. If you land at Suvarnabhumi Airport, you can take bus S1, to exit 7. At the moment there are no SkyTrain or metro stops near Khao San Road. If you get off at the last stop of the MRT, which is the Hua Lamphong train station, it would take about 45 minutes on foot to get to Khao San Road. After several years of work, the extension of the metro blue line is finally almost done. In August of this year there will also be a stop at Chinatown, called “Wat Mangkon”. Then the distance to Khao San Road will be shortened by a few kilometers. The final way of getting to the backpacker neighborhood is by boat. If you get off at the SkyTrain Saphan Taksin stop, you can take the boat that will take you on the Chao Praya River to the Phra Arthit Pier stop. Once there, all you need to do is ask anyone passing by which direction to go for Khao San Road. First of all, click here to read our article about hotels in Bangkok. As a popular destination for backpackers and those looking for low cost accommodations, Khao San Road mainly offers hostels and guesthouses. Yet you can also find mid-high range options. Starting with a budget of 650 THB a night, a good guesthouse is the Viman. Situated just a kilometer from Khao San Road, this building offers a wifi connection and garden to relax in. All rooms are private, for either one or two people. Another option that offers private rooms is Siri Suvan @ Rambutti Guesthouse. Here too you’ll have an internet connection, and a small little open-air restaurant where you can try the most famous Thai dishes. If you’re a fan of cooking, or are simply curious to discover the local dishes, I recommend that you read our article entitled “The most famous Thai dishes and where to eat them in Bangkok”. For 300 THB a night, you can stay at the Oh Botique Guesthouse. Located a little more than 5 minutes on foot from Khao San Road, this guesthouse offers modern-style rooms in a peaceful and quiet area. In the hostel and dormitory category you’ll find 3Howw Hostel Khaosan. This building lets you book without a credit card and also has breakfast included in the price. A spot in a mixed dorm for 10 people costs a little more than 230 THB. The Roof View Place is only 700 meters from Khao San Road. Here too breakfast is included in the price and you can eat Thai food at the onsite restaurant. A single room costs 560 THB, a double 960 THB and a triple comes to 1,320 THB a night. Korbua House is a 3 star hotel located a short distance from the Wat Bowonniwet temple, which is also called the Marble Temple. Some double rooms offer views of the Chao Praya River at a price of 1,350 THB a night. The Baan Chart Hotel has different types of double rooms. Prices range from 1,800 to 2,800 THB a night. It has a great location: just 2 minutes on foot from Khao San Road and 10 from Santichiprakan Park. The Taraplace Hotel Bangkok, located on Ramsen Road, is a mid-range hotel. It doesn’t include amenities like a pool or gym, just a restaurant. Room prices are lower than other 3-4 star hotels: 1,125 THB for a standard double room, 2,700 THB for rooms with 4 people. The SSIP Boutique Dhevej Bangkok is located slightly farther away than the others: 15 minutes on foot from Khao San Road. The daily rate for a double room is 2,300 THB; deluxe rooms can go up to 2,900 THB. Staying on Khao San Road or in the area is particularly recommended for young travelers looking for fun in clubs and discos, or those who want to spend a few days visiting the area around the royal palace and reclining Buddha more in-depth. If instead you’re planning on spending your time mainly in other parts of Bangkok, such as Sukhumvit or the northern part of the city, you can stay in a more central neighborhood, such as Victory Monument. This way you can just arrange a day trip to see the most important sights on Rattanakosin Island. Food options on Khao San Road are extremely varied. One of my favorite vegetarian restaurants is May Kaidee’s Tanao Restaurant. Located on a small street two minutes from Khao San Road, at May Kadee you can also participate in various types of cooking classes: group, private, preparing homemade tofu, carving fruit and vegetables, or creating dishes with just raw food. Prices at this restaurant are higher than those at the many stalls; pad thai for example, will cost between 30 and 40 THB on the street, while at May Kadee it costs 120 THB. The quality and quantity of the food is certainly worth the price difference, especially if you’re curious to try traditional dishes revisited in other versions or a little more uncommon food like squash hummus. Personally I recommend you try the fresh spring rolls trimmed with a delicious peanut sauce, but also the massaman curry soup (80 THB) and the typical mango sticky rice prepared with red rice instead of traditional Thai rice. For drinks too May Kaidee Tanao offers various original options such as fresh homemade juices or various herbal teas. Right near May Kaidee, on the same road, you’ll find another vegetarian restaurant, Ethos. Inside you’ll find several tables where you can eat in pure Thai style, seated on the ground. For this reason you’ll be asked to leave your shoes at the entrance. This place offers both Thai and international dishes. An excellent choice is the lasagna, available in both a vegetarian and vegan version. There are also different hamburger options starting from a price of 165 THB each. When it comes to dessert, you absolutely cannot miss trying the pancakes. There are some for all tastes, from those with hot berry mousse, to those with banana and mango, to more typical ones with chocolate. Prices start at 120 THB, and you can easily split a dish between two people since the portions are huge. If you’d like to dine on the Chao Praya River and enjoy a great view of the Rama VIII bridge lit up, you can opt for the In Love Bar and Restaurant. The menu offers a vast selection of Thai dishes that include meat and fish. The Chabad House offers typical Hebrew Kosher cuisine. The menu includes meat, fish, vegetarian dishes and Thai recipes revisited in Jewish style. Located at number 108 Khao San Road, Buddy Bear Wine Bar and Grill, established 20 years ago, you can both eat and spend the night listening to live music. Tom Yum Kung is a typical Thai restaurant. It too is located on Khao San Road, offering mainly fish dishes. Prices are average for what tourists will pay to eat along Khao San Road: a dish of Tom Kha Kung (a soup of coconut milk and shrimp) costs 170 THB. Other than Thai and international restaurants, there are also chains such as Mcdonald’s and Burger King. As with all of Thailand, on Khao San Road too you can eat street food. Stalls sell Pad Thai, rotee (which are a type of fried crepe), pancakes, corn on the cob, grilled banana leaves stuffed with rice, exotic fruit drinks, and insects. Many street vendors, seeing how tourists take pictures of the insects for sale, have begun putting up signs that they now charge for taking pictures of their food. Objectively, if you’re looking to have a nice dinner, with the exception of May Kaidee Restaurant, I don’t recommend that you eat on Khao San Road as the quality of the food is definitely not the best. Having been the center of the capital of the Kingdom of Siam, Phra Nakhon is a neighborhood rich in historical monuments. Within it are two basic symbols of Thailand, such as the Great Royal Palace and Wat Pho. The first, called พระบรมมหาราชวัง in Thai, is a vast complex of buildings where besides the throne room and other royal quarters, you can also see the Emerald Buddha. Built in 1782, the Royal Palace covers an area a little less than 220,000 square meters, surrounded by white walls forming a perimeter of almost 2 kilometers. One of the most important and venerated buildings in all Thailand, where you can’t even take pictures, is the Residence of the Sacred Jewel of Buddha: a complex made up of many buildings located near the entrance. Also built in 1782, this temple is different than all other temples in the country, since other than the fact that monks can’t live there, inside it contains the Emerald Buddha. The statue is an emerald color Buddha carved from a piece of jade from the 15th century. Don’t expect a giant Buddha such as the one inside Wat Pho; this statue is in fact a little less than 70 centimeters tall. Seated in a meditating position, three times a year (when the seasons change) they change the tunic. All clothing for the Buddha are made from gold, and when they’re changed there’s an entire ceremony organized and led by the king. Inside the walls, other than temples built in Thai architecture, there’s also a reproduction of the temple of Angkor Wat in Cambodian Khmer architecture. Although not at actual size, this monument will give you an idea of the majesty you can admire if you decide to go to Siem Reap. All the murals (178 sections total) that you see painted along the walls of the temples represent the story of Ramakien, the Thai version of the Indian poem Ramayana. Photos and descriptions don’t do this stupendous complex full of colors and different architectural styles justice. I recommend that you visit the Royal Palace in the morning when the sun isn’t at its strongest and temperatures are mild. Hours of operation are from 8:30 to 15:30. Thais can enter for free while for foreigners a ticket will cost 500 THB. Remember that this is considered a sacred place and appropriate attire is required (even tight pants like leggings are not considered acceptable). Just a few meters from the Royal Palace is Wat Pho. This too is a complex of various buildings with an imposing reclining Buddha statue inside that’s covered entirely in gold. 43 meters long and 15 high, besides being one of the city’s icons, this Buddha is located within the oldest temple in Thailand. The statue of the reclining Buddha takes up the majority of space inside the temple and you can admire it thanks to a corridor that goes along the perimeter. At the rear you can participate in the ritual of the coins: you get old coins that are then placed into metal bowls. If once you finish your walk at the same time as your coins run out, the prophecy says that you’ll have a bright and lucky future. Wat Pho is also home to the country’s first school for Thai massage and traditional medicine. These days you can both attend lessons or get a massage from one of the students. To see all the temples and attractions that are in Rattanakosin would take several days. Nevertheless, some of the biggest temples certainly deserve a visit, as several are just a few hundred meters from each other. If you decide to visit the Royal Palace or Wat Pho, organizing a visit is easy. Wat Bowonniwet Vihara is considered a top notch royal Buddhist monastery. Small but of rare beauty, this complex was built in 1824 by King Rama IV and today it’s the seat of the Dhammayuttika Nikaya of the Therevada monastic order (the form of Buddhism that 95% of the Thai population follows). Its history has ties to the Thai royal family; the king who ordered its construction also spent a good 27 years of his life at this temple. the various residences reserved for those of the highest Buddhist positions and the royal family, called Phra Tamnak. Located a few hundred meters from Khao San Road is Wat Chana Songkhram, a temple-monastery going back to the 18th century. Its Thai name, which means temple of the victory in war, comes from the battle of the 9 armies that took place at the end of the 1700’s between Thailand and Burma. The golden Buddha statue, 3 and a half meters tall and located inside the main building, is venerated daily by people from all parts of the city. The temple of the pillar, also called Sao Lak Muang, is a Buddhist structure located next to the royal palace built in April 1872, when King Rama I decided to make Bangkok the new capital of his kingdom. Wat Suthat is a temple that’s famous for its Giant Swing located in front of the entrance. Also called Sao Ching Cha, it was built in 1784 by King Rama I. Closely tied to Buddhist-Hindu tradition, Wat Suthat extends over a surface of 4 hectares, making it among one of the biggest temples in the city. The neighborhood’s ancient Chinese temple is the Tiger God Shrine. Despite being a Taoist symbol, this place is often visited by the Thai Buddhists. Entrance is free and every day it’s open from 8 to 17. The buses that go by this temple are numbers 10, 12, 19, 35, 42. To conclude, we can’t fail to mention Wat Arun, a gorgeous temple situated to the west of the Chao Phraya River. Among the museums you can visit are the National Museum and the Museum of Siam. Located within a neoclassical house, if you visit the latter you can admire what in English is called “Thainess”: the customs and costumes of Thai tradition and their evolution over the centuries. Don’t expect a classical museum, but quite the opposite; the entire exhibit is staged in a modern and technological style, which is very stimulating for those who aren’t big fans of museums. in the last part you’ll find the golden boats used during royal funerals, along with typical buildings considered to be true works of art, such as the Buddhaisawan chapel built in 1787 and decorated with magnificent paintings going back to the Rattanakosin, and even a few pavilions. The Rama VIII Bridge crosses the Chao Phraya River from the banks near Bang Khun Phrom Palace up to Rama VIII Park. The shape of the bridge is particular, as it consists of a single pillar more than 150 meters tall supporting a bundle of various iron cords. Among the things that you can do outdoors is to visit Santi Chai Prakan Park. The old headquarters of a sugar factory, today the park has become famous for its extremely white Phra Sumen Fort. This monument was built in 1783 for the purpose of protecting the city from potential attacks from the river. Another famous park that can be easily reached from Khao San Road is Sanam Luang. Besides being a green space, it is also considered a traditional place for all official ceremonies. Spiritually speaking, this area is considered one of the luckiest in the city along with the Great Royal Palace. For this reason you’ll find lots of lucky charm vendors. At the amulet market you can also find astrologers that will read your hand or predict your future with the use of cards. The Thais are a very superstitious people. The majority of the population daily puts on amulets as protection against evil spirits as well as to have good luck or attract a twin spirit. Many have a rectangular shape, but you can also find them in the shape of the Buddha or reproductions of sacred statues. In this area you’ll also find two well-known universities: Thammasat University, famous for its law and political science faculty, and the Silpakorn University of Fine Arts. The former sadly became known in the media worldwide when during the 70’s more than 40 students lost their lives during a protest against an ex prime minister’s return to Thailand from exile. The democracy monument was built in 1939 to celebrate the birth of the constitutional democracy and the end of the Kingdom of Siam. Here too, as with Hualamphong Station, an Italian was involved: the sculptor Feroci. in the center you’ll find an inscription of the Thai constitution since 1932.
pratice muay thai (Thai boxing) at the Sor Vorapin gym, where several national champions have trained and these days also offers lessons. Some foreign tourists who visit Khao San Road are impressed when they see the low prices for getting a tattoo, and get caught up in the moment. Before going through with it, I recommend that you take a good look at the studio and pay attention to the parlor’s cleanliness and the tattoo artist’s hygiene. I don’t suggest going shopping on Khao San Road. Other than a few odds and ends and the typical elephant pants, there are very few things worth buying here. Be especially careful of anyone looking to sell you jewels in silver or other precious stones, which aren’t precious at all. If you want to buy souvenirs, typical local objects, or clothes without spending your inheritance, you can take a trip to Chatuchak Market, or big stores like MBK and Terminal 21. Here you can find detailed information on Bangkok’s markets and shopping malls. One of the most popular pubs is Gulliver’s Traveler’s Tavern, which is part of a chain that’s also in Sukhumvit and Pattaya. In this pub you can sip a local beer, play billiards, listen to live music, watch international soccer games on the big screen, play videogames, and even eat international dishes like hamburger and steak. Numbered among one of the top 5 bars on Khao San Road, The Brick Bar offers free live music during the week. On weekends, the entrance fee is 300 THB a person. The Club is perhaps the most famous disco on Khao San Road. The music played by the DJ is generally house and techno. There’s usually no entrance fee, though on certain evenings you’ll be asked to pay 200 THB, including a drink. They’re open between 22 and 3 in the morning. There’s no particular dress code to stick to. Remember to bring a copy of your passport with you since everyone’s documents are checked at the entrance. The Superflow Beach Club will give you the sense of being at the beach, with its floors covered in sand and lounge chairs. It opens at midnight, and the price of beer is included (90 THB), considering that its a disco. The list of pubs and discos where you can hang out in the evening is very long. I suggest that you come by Khao San Road and discover in person which ones you prefer; there are places for all tastes and budgets … A word of advice: when walking along Khao San Road also look up; some pubs where you can listen to excellent live music (like The Roof Bar) are located on the second floor and have tiny entrances on the street that are not easy to see if you’re not paying attention. In my opinion, unless you have a job at United Nations headquarters or in another area close to Khao San Road, I don’t suggest that you live in this area, especially for the difficulty in getting around. The majority of lodging in Rattanakosin are properties to own, while there are practically no condominiums up to European standards.